Expedited domestic shipping methods such as air freight and exclusive truck get your freight to the final destination quickly. At one time or another, companies will need to get their products to a particular destination quickly. There are two options available for expedited shipping to domestic destinations – air freight and exclusive truck (also known as FTL ground). Making the right decision between the two will involve weighing the pros and cons of each method and determining which solution works best for your needs. An experienced logistics provider like AFP Global Logistics can also help you make the best choice for your needs. Here are some of the differences between air freight and exclusive truck for domestic expedited shipping. Air freight is a significantly faster option for shipping than exclusive truck, so this may be a key consideration if your freight needs to travel a long distance in a very short period of time. For example, companies looking to move perishable items will need to utilize air freight to ensure that their cargo makes it safely to the final destination. Also, security at airports is much tighter than on the roads. This heightened security makes air freight the way to go for companies shipping fragile and valuable items. And though the risk of a truck being hijacked on the roads is very minimal, accidents are still more common than in the air and potholes can damage your freight in transit. On the other hand, if the cargo needs to travel a shorter distance, exclusive truck may be the best option because it is much more economical than air freight. Air fuel costs and fees are typically passed onto the shipper, which may make this cost-prohibitive for some shipments. 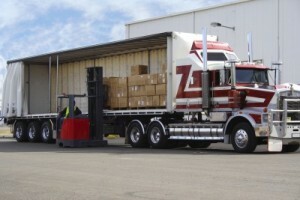 Moreover, exclusive truck shipments can handle larger, heavier items more easily than air freight shipments. Airplane sizes vary and nearly all shipments handled in the air are subject to size and weight restrictions. And while it is possible to send heavy items through the air, the airlines may tack on weight surcharges. This entry was posted on Monday, April 17th, 2017	at 9:51 am	and is filed under Shipping Methods	. You can follow any responses to this entry through the RSS 2.0	feed. Both comments and pings are currently closed.